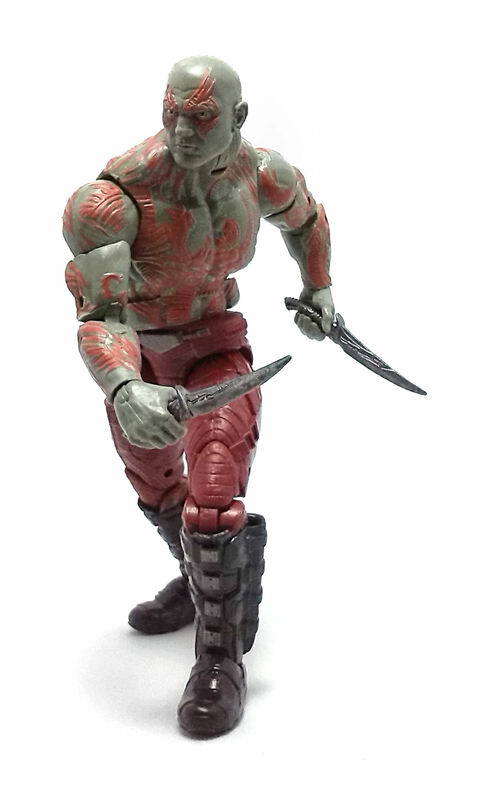 Out of the Marvel Legends Infinite Series regular action figure assortment, produced for the Guardians of the Galaxy movie, I have to admit that Drax the Destroyer is the one I like the most. That is something I did not quite expect, given my almost complete ignorance of the character’s publication history and the overall notion that he was merely developed to fill in the role of a space Wolverine for his team. However, the way the Drax role was portrayed in the movie really caused me to change my mind about this character. 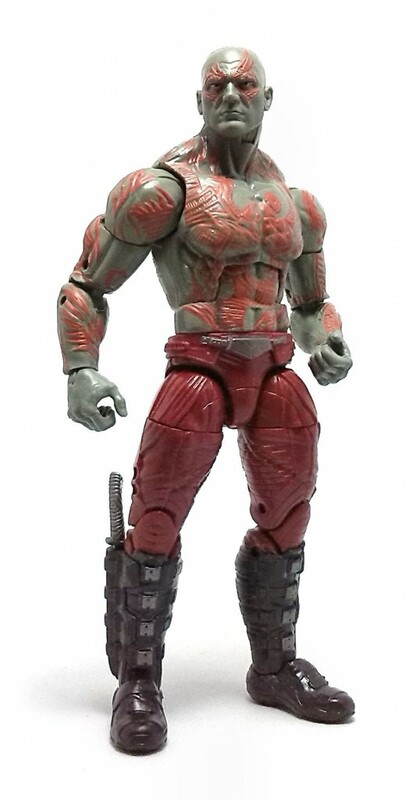 The movie design for Drax is noticeably different from his comic book interpretations, since in the movie the markings on his skin are raised, more akin to ritual scarifications than a flat tattoo design. The overall sculpture is quite detailed, and it is possible to see a clear resemblance to wrestler/actor Dave Bautista, a.k.a. as WWE’s Batista in there. 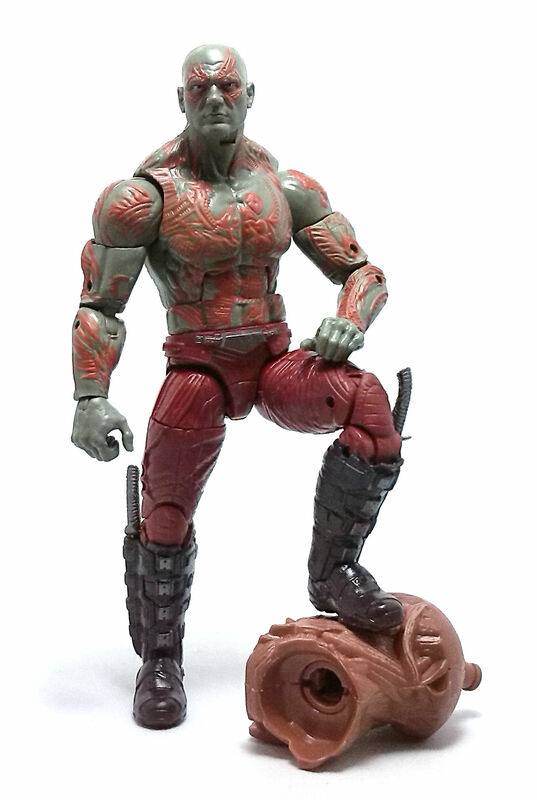 One neat thing about the sculpture is that it features sheaths at the side of his boots that are not too bulky, yet are the perfect size to carry Drax’s knives. The knives are also nicely detailed, with grooves and lines etched onto the blades and handles. 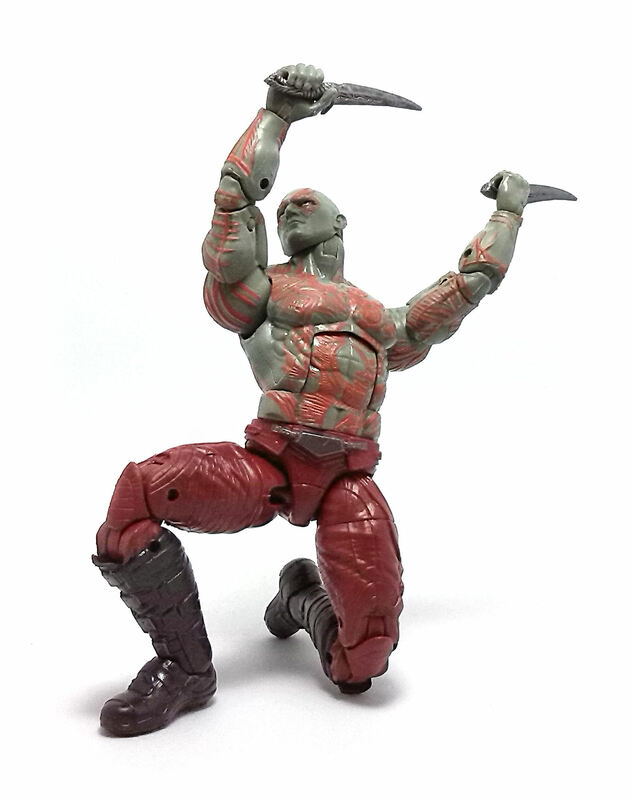 Each of these joints works flawlessly, allowing Drax to adopt a great deal of dynamic poses while maintaining good stability. 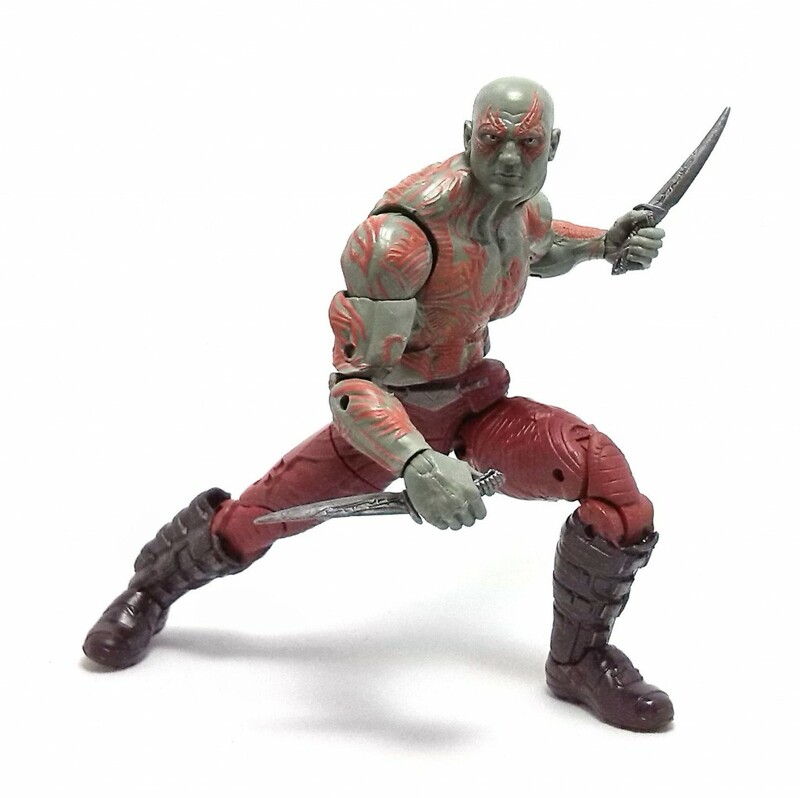 The paintjob on Drax is rather minimal. The figure was molded out of a dark burgundy red for the pants, dark brown for the boots and a muted green plastic from the waist up. Most of the actual paint applications consist on the red torso markings, which, due to their organic appearance, can get away with not being perfectly aligned to the sculpted detail. The rest of the paint applications are limited to a few gunmetal accents applied to boots and buckle, with neat clean eyes painted onto the head. 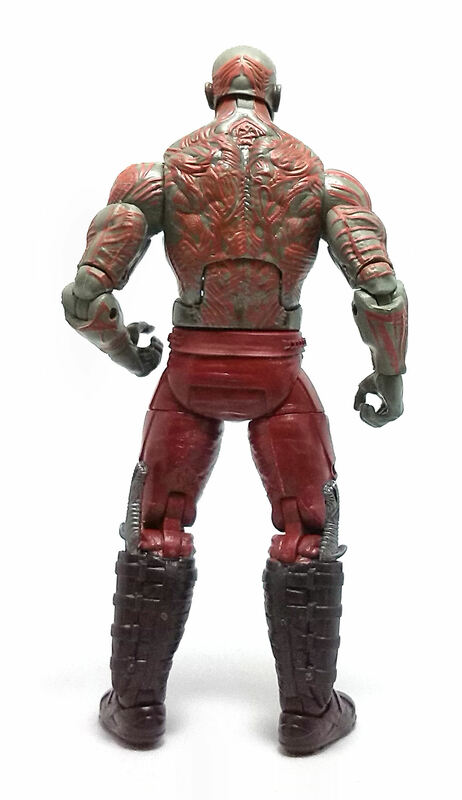 Other than the pair of ornate blades included, Drax also comes with the lower torso piece to complete the Groot Build-A-Figure. This piece was molded from brown plastic and sports some very subtle green highlights to simulate moss growing on the sculpted bark texture, as well as sockets to connect to the legs and upper torso.